MauSketch - The Art of Mauricio Abril: Happy Father's Day Eve with "Con Dad"
Happy Father's Day Eve with "Con Dad"
Happy Father's Day Eve! One of the funnest things about doing conventions is seeing all the different kinds of people that come up to my booth including the parent/kid combos. 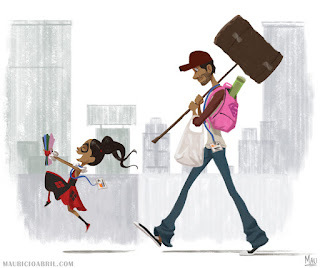 This piece entitled "Con Dad" combines the more modern day younger 'Geek Dads' that I've seen at cons with the age old tradition of dads being the default pack mules everywhere they go. To all the dads both young and old, may your backs remain strong! Happy Father's Day 2016!